Read Back Pain – Not This Spring! by Dr. Paul Miller to learn more about Advanced Chiropractic and our Chiropractic office in Spokane, WA. April showers bring May flowers, but what can May flowers bring? That’s right – possible back pain. As springtime gets under way, we head outside into the warm weather and begin the spring clean in our garden. We are invigorated by the warmth and begin tackling the garden in Gung-ho style. Although gardening can provide a great workout, all the bending, twisting, reaching and pulling, your body may not be ready for exercise of the garden variety. Before stretching for any activity, breathe in and out, slowly and rhythmically; do not bounce or jerk your body, and stretch as far and as comfortably as you can. Don’t follow – “the no pain, no gain rule.” Stretching should not be painful. One exercise to do is sit and prop your heel on a stool or step, keeping the knees straight. Lean forward until you feel a stretch in the back of the thigh, or the hamstring muscle. Hold this position for 15 seconds. Do this once more and repeat with the other leg. Next, stand up, balance yourself, and grab the front of your ankle from behind. Pull your heel towards your buttocks and hold the position for 15 seconds. Do this again and repeat with the other leg. Then while standing, weave your fingers together above your head with the palms up. Lean to one side for 10 seconds, then to the other. Repeat this stretch three times. Finally, do the “Hug, your best friend.” Wrap your arms around yourself and rotate to one side, stretching as far as you can comfortably go. Hold for 10 seconds and reverse. Repeat two or three times. 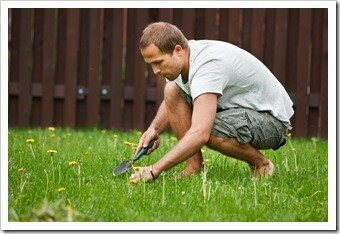 Most importantly be aware of your body technique, body form and correct posture while gardening. Kneel, don’t bend, and alternate your stance and movements as often as possible to keep the muscles and body balanced. This entry was posted on Tuesday, May 2nd, 2017 at 9:17 pm and is filed under Health Articles. You can follow any responses to this entry through the RSS 2.0	feed. You can skip to the end and leave a response. Pinging is currently not allowed.